When BMW invited me in to their studio in Munich in 2015 to talk about the Graphic design for a top secret new project I was more than a little excited and curious about what the project might be. As they started briefing me about the bike, I think my eyes grew wider and wider. Yea, I was stoked to do the color and graphics for it, but what I really wanted to do was ride the thing! Limited to just 750 units and available at a price of £68,000, or 80k euros, and for closed circuit use only, this is one seriously special and exclusive superbike, complete with a carbon fibre frame and full race spec! The design is really just a blend of the BMW SP4 and classic HP Styling they use on limited edition models. Below you can see the feedback they gave me on the concept they chose from the first versions I presented..
My work was done on the project at this stage and the internal team at BMW took over and kept refining and tuning the design to the final version you see below. I think they did a really great job, especially with the iconic front mask, tank and tail and adding some red into the mix. 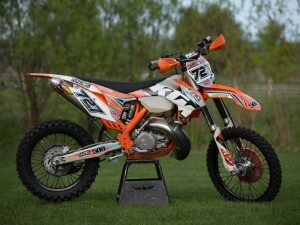 Such a sick bike from A to Z! 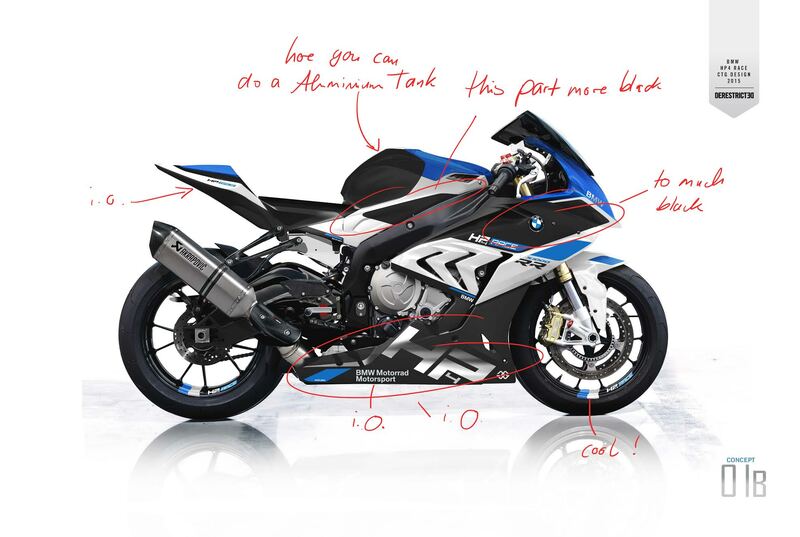 “Fascinating technical solutions for maximum performance on the race track have always been the hallmark of hand-picked factory racing motorcycles modified to perfection down to the last detail. 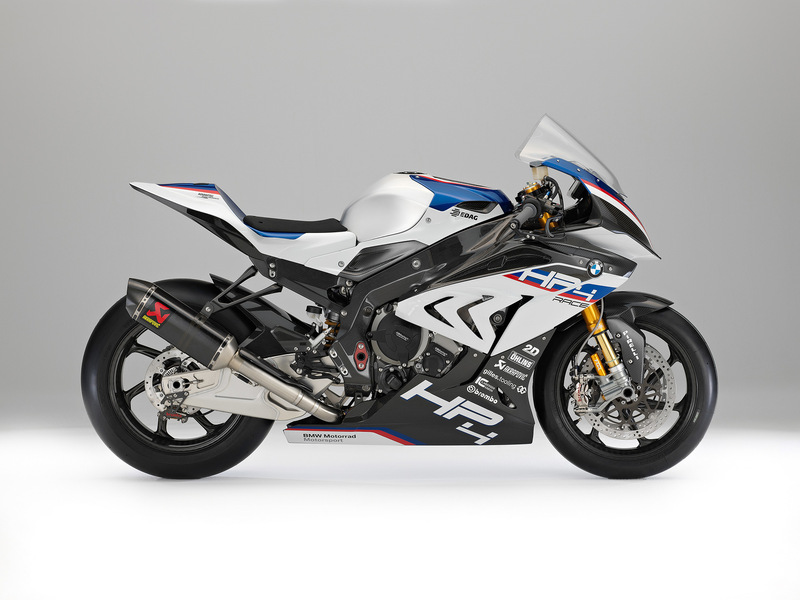 With the new HP4 RACE, BMW Motorrad presents a purebred racing bike in a production run of 750. It is individually crafted by a small, highly specialised team, ensuring the very highest level of quality. 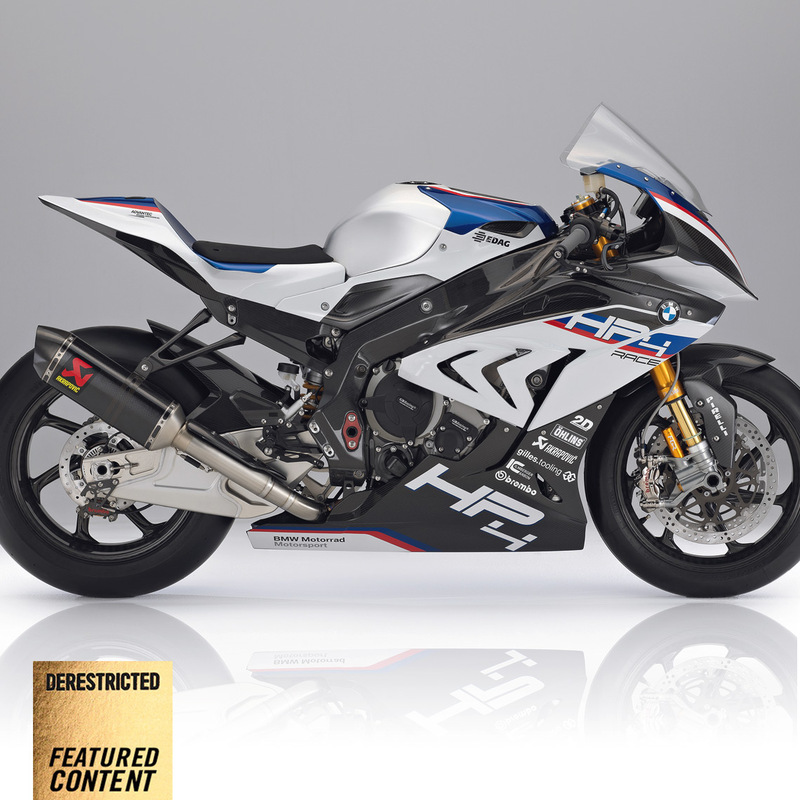 The new BMW HP4 RACE: individually crafted high-tech and innovation for top performance on the race track. 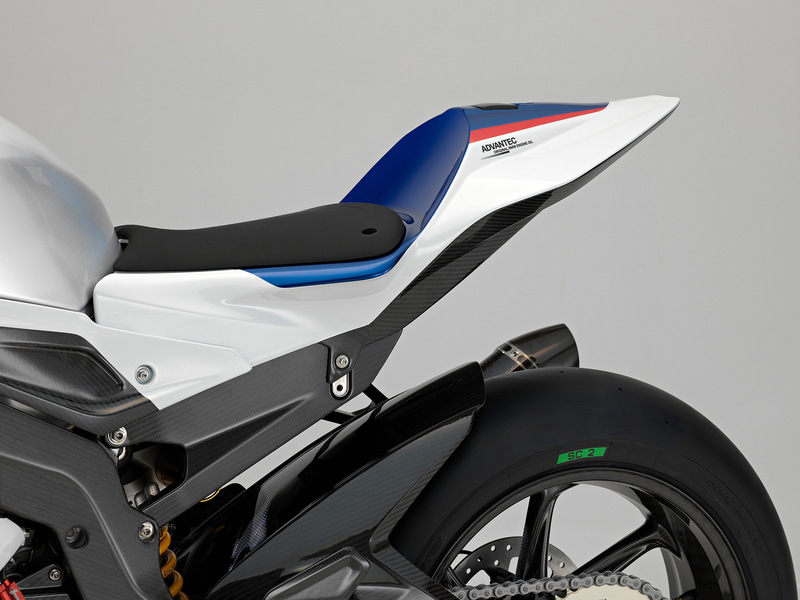 In terms of engine, electronics and spring elements, the new HP4 RACE is in the same category as current superbike factory racing machines, even surpassing this level in the area of suspension with its carbon fibre frame. 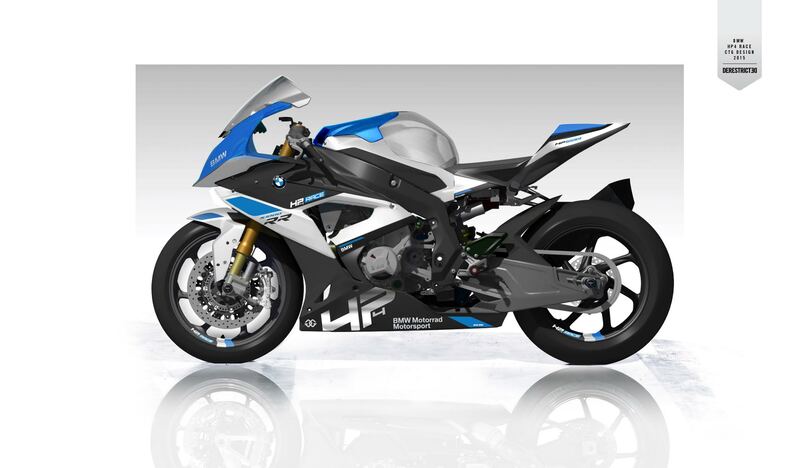 Weighing 171 kilograms when fully fuelled and road ready, the new HP4 RACE is even lighter than the factory racing bikes currently used in the Superbike World Championship and is only slightly above the MotoGP factory racers in terms of weight. 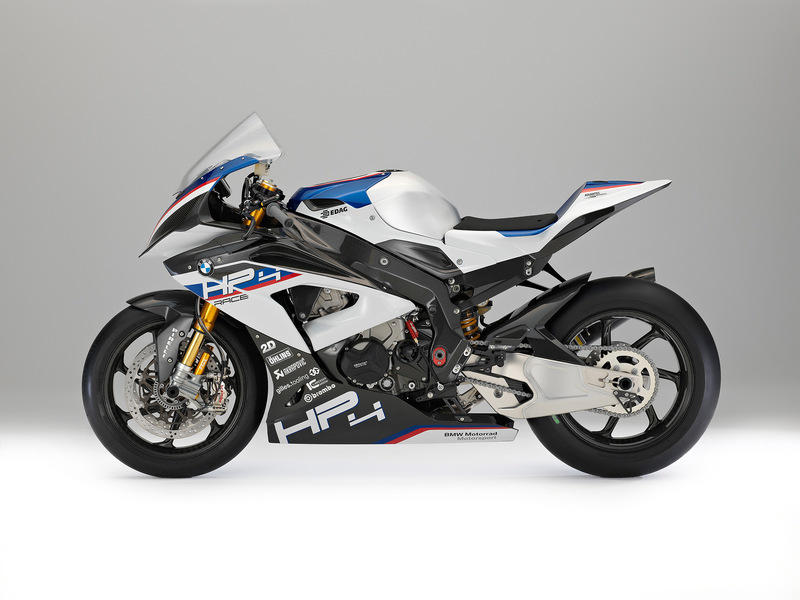 The new HP4 RACE has a purebred racing engine similar to specifications 6.2 and 7.2 as in the Endurance and Superbike World Championships. The peak output is 158 kW (215 hp) at 13 900 rpm. The maximum torque of 120 Nm is reached at 10000 rpm. 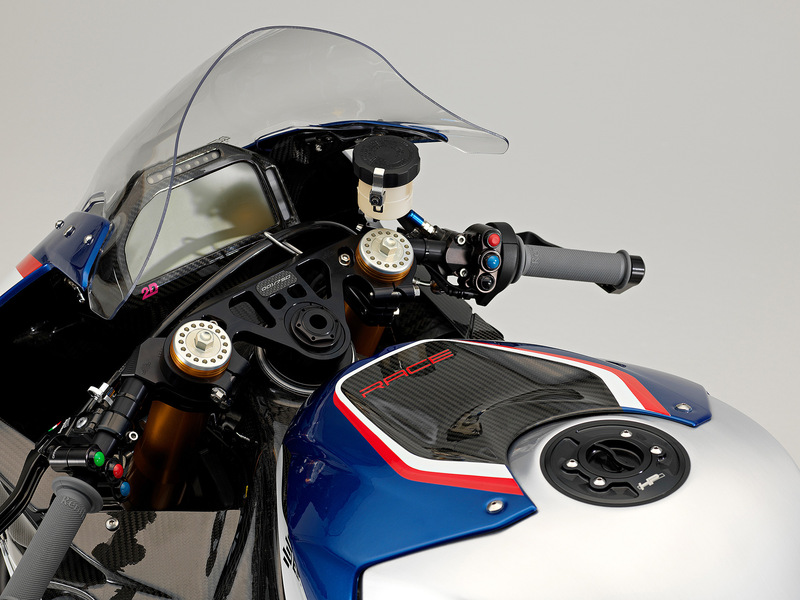 The maximum engine speed has been increased as compared to the engine of the S 1000 RR from 14 200 rpm to 14 500 rpm. With the aim of achieving the best possible performance, a 6‑speed close-ratio racing gearbox is used with optimised transmission ratios and various secondary ratios (diverse pinions and chain sprockets included). Carbon fibre main frame in monocoque construction weighing just 7.8 kilograms. Self-supporting carbon fibre rear frame with three-stage height adjustment function. Carbon fibre wheels offering a weight reduction of some 30 per cent as compared to light alloy forged wheels. Öhlins FGR 300 upside-down fork. Öhlins TTX 36 GP spring strut. Brembo GP4 PR monoblock brake calipers with 320 T-type racing steel brake disks (thickness: 6.75 mm) at the front. 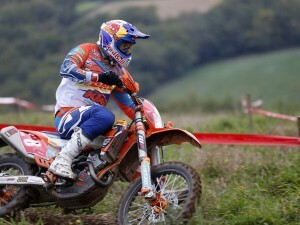 Racing engine at World Cup level with an output of 158 kW (215 hp) at 13 900 rpm and a maximum torque of 120 Nm at 10 000 rpm. Close-ratio racing gearbox with adapted transmission ratios. Weight-optimised electrical system featuring light lithium-ion battery with 5 Ah. 2D dashboard and 2D data recording including logger. Dynamic Traction Control DTC (programmable for selected gears at 15 levels). Engine Brake EBR (programmable for selected gears at 15 levels). Wheelie Control (programmable for selected gears). Light trim parts made of carbon fibre with snap fasteners. Paint finish in BMW HP Motorsport colours. Production run of 750 units, each individually crafted. Thanks for sharing a “behind-the-scenes” look at what goes into doing what you do best. Loved reading this article! Great job!